The Movie & Expanded Chapters can be purchased with a ‘per user’ license via our online learning platform. The Movie (on its own) is available for purchase in DVD format, to those who wish to acquire the screening license for organisational use or training purposes. Please note that the Expanded Chapters are not available on DVD. 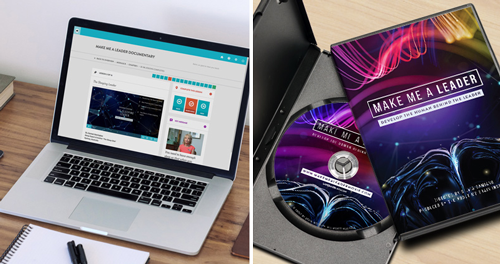 Per User License: For organisational use or training purposes, you can purchase the license per person of either the ‘Make Me A Leader’ Movie (on its own) or our online learning course which includes the Movie and the Expanded Chapters. Screening License: A screening license is necessary for any public showing of ‘Make Me A Leader’. By purchasing a screening license, you are able to show the film to an audience or use it within an organisation for training purposes. License pricing varies with audience size.